Remember to spread your own wings and lift your face to the sun every day when you see the original Butterfly Goddess painting in your home. 24 x 36″ oil painting with 24k gold leafing on her chest, wings, and bottom of painting. Own the original 24 x 36″ painting of “Transcend”. Let the Butterfly Goddess remind you of your own divinity, beauty, and ability to transcend the hardships and heartaches of your life and the world, to become something more beautiful and brave. Oil and 24k gold leaf on panel. 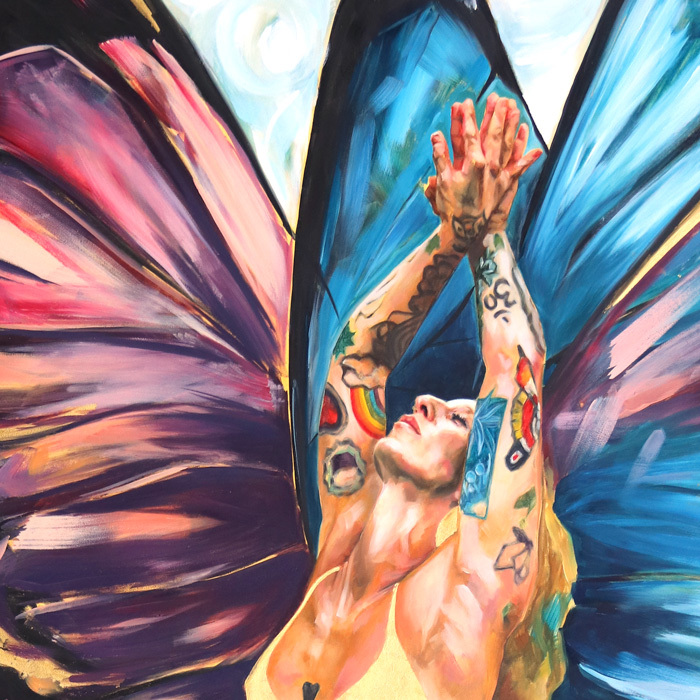 The majority of the painting is done in oils with the exception of the 24k gold leafing used on her jewelry, top, butterfly wing accents, and bottom background of the painting.